A condition caused by a sexually transmitted organism. Lymphogranuloma information including symptoms, diagnosis, treatment, transmission, prevention and other general information. Lymphogranuloma inguinale infects on average about 250-400 people a year in the United States. 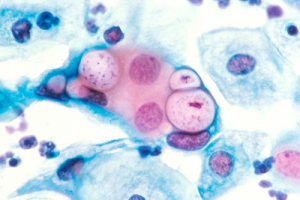 These methods are used to detect nucleic acid (DNA) by amplification techniques and are used for testing urethral, cervical or urine samples but are not often used for Lymphogranuloma inguinale. Lymph node biopsy may be used to make differential diagnoses with atypical infections and neoplasia. Lymphogranuloma inguinale is a very persistent bacterium, and penicillins are ineffective in treatment because they can suppress the bacteria without killing them. Early treatment is essential to reduce the severity of the chronic phase. A 3 week program of antibiotics is recommended to kill the infection. Patients allergic to Cyclines should be treated with Erythromycin. pregnant and lactating women should be treated with Erythromycin.